Unbelievable strong and sticks great! Great for attaching a metal rail to camper roof to hold solar panels. This tape sticks to every surface that i have used it on Holds very well. 100's of uses. 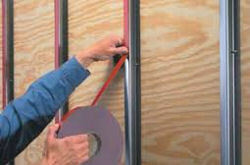 3M 5952 Double coated VHB Acrylic Foam Tape. Soft conformable foam molds to irregular surfaces. Bond painted metal and plastic with little or no surface priming or abrading. Special formulation also bonds on contact to most paints and powder coats, and to hard-to-bond plastics such as acrylic, polycarbonate, and high temperature co-polyester. Resists moisture, UV and solvents. Indoor/outdoor. 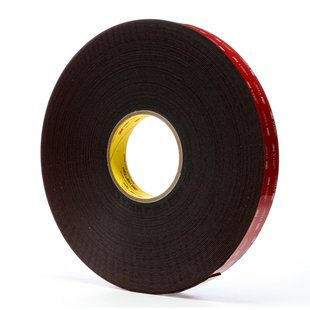 Black acrylic foam with acrylic adhesive; red polyethylene liner. Temperature range is -40°F to 300°F. -Bonds well to many painted surface including powder coated paints. -Bonds well to a variety of plastics including low surface energy plastics. -Bond painted aluminum stiffners to power coated access doors. -Bonds on contact to most paints and powder coats, and to hard-to-bond plastics such as acrylic, polycarbonate, and high temperature co-polyester. Used in many industries including Oil & Gas, Building & Construction, Appliance industry., etc..
Do not forget to make sure all surface are clean and dry because dirt, Oil, paint, dust, release agents, inhibitors, and other contaminants on the surface of the substrate can interfere with the adhesive and affect the bond. General cleaning using a 50/50 mixture of Isopropyl Alcohol and water then drying with a clean lint-free cloth is the simplest way to make sure a surface is clean. You can also use 3M Surface Cleaner. On some surfaces either abrade or with some low surface energy plastics such as polyethylene, use an adhesive enhancer such as Primer 94.